Thanks guys, really hope you can help. Also I find when studying the frequency spectrum of most professional complete mastered mixes/songs. How would you apply this to mastering a whole song too? Spectral analysis can be very useful but only teamed with listening, and to a representative long sample. One reason is that at any given moment the plot can greatly change as moment by moment, the music changes, and that can be OK. For all we know your unknown recording might be perfect for what it is, but the spectral plot isnt enough to tell us that. On its own it's basically meaningless. There can also be issues of taste, preference, musical arrangement. Better to give us an actual representative sound file which we can all listen to and then if needed we can do our own spectral analysis (and a moving one at that) while also listening to the audio file. Edit; just listened to the YT upload which earlier I couldnt access from here. The moving plot at least had more detail and there is the faint, thin sound of a strummed guitar but again, far better if we can hear the sound properly. That's far better than the plot which as I said, we can do at our end easily enough. Edit 2: Also heard some of your other YT uploads. As a player myself I enjoyed your guitar playing both solo and in the live group. Which is to say the recordings are IMO already "good enough" to showcase your musicianship and musical sensibility to anyone willing to give it a fair listen which is the most important thing in my opinion. There might be some adjustments need to showcase it better which I'm sure others will be happy to discuss here on the forum. Good work. I made that video asking that question in 2013 when I was 16 actually. I'm trying to get back into mixing and mastering again and it was a lingering question so I decided to ask again.. Thank for your reply though and about my videos on my channel, I appreciate it! The spectrum is what it is, but it's simply dependent on all the sounds that are present on the track. If you only play a few notes at a time, then you will only produce a few frequencies and they'll show as 'spikes'. That doesn't make it wrong at all, it's 100% correct for that sound. Add in vocals and you'll get a different set of frequencies to add in, which will add some more spikes and start to fill in the gaps a bit. You don't hear music with your eyes, so just use your ears to tell you what sounds good. If it sounds good, then it is good. Frequency displays on EQs can help pinpoint problem frequencies, but they can't show the difference between good music and bad music. Having said all that, there are plug-ins that can help match one track's frequency balance against another. 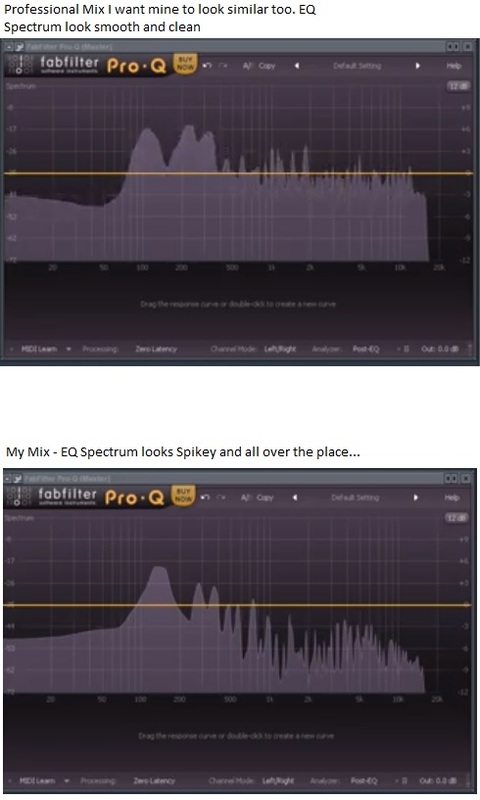 I believe the Fab Filter ProQ has an EQ matching function. But you need a suitable reference track with like for like instrumentation. Another mastering program is Har-Bal, https://www.har-bal.com/ which also has an EQ matching feature but can help get a more 'harmonically balanced' (hence the name) sound. But you still need to use your ears and not go by wavy lines on the screen. Cheers Wonks... Thanks for the info. As a note, an effect of full band limiting is to raise up the level of everything (noise included). This will usually translate graphically into an average spectrum with a bigger lower area. As other said tough, it's not really something to give much attention to... but if you don't like what you hear, the spectrum can give you some hints of where to go to fix it.